This is a musical retelling of the classic tale of a very unusually special friendship . 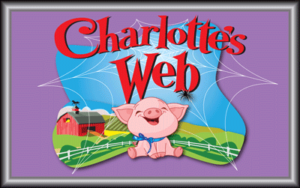 Charlotte, the spider, teaches Wilbur, the pig , his worth and makes huge sacrifices for their friendship. The whole Zuckerman gang is there, with all the barnyard friends as well. Themes of anti-bullying, working together paired with adorable music makes this show a hit! Music and lyrics by Charles Strouse. Due to the nature of theatrical bookings all shows, dates and times are subject to change. Youth performances are show only and do not include buffet meals.